Home / HVAC Technician / What is HVAC Certification? Working as a professional HVAC technician requires certain certification and licensing standards, which can vary by state. One of the most important types of certifications is an EPA certification, which is required to work on refrigerant systems. Additional certification is sometimes necessary at the state level. HVAC technicians who have at least 1 year of installation experience and 2 years of repair and maintenance experience can also choose to become certified in specific equipment types. 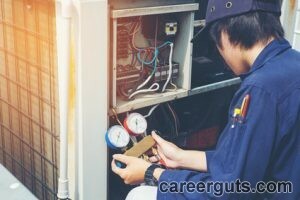 Even when it is not required to become employed a technician, HVAC certification can be very helpful in the job market. Certified HVAC technicians also make more money on average. The first level of certification for an HVAC technician is an entry level certification, which is usually issued by a trade school, technical school, or high school. 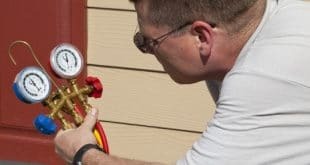 This certification tests for residential heating and cooling installation and repair knowledge and it is designed for technicians with less than 2 years of work experience and those still completing training. Ready-to-Work, an online entry level exam for those entering the industry with no formal training or experience. Under the Clean Air Act, the EPA 608 certification is required for all people who have access to any container or system containing refrigerant, including A/C coolant, in an effort to protect the ozone layer. Without this credential, HVAC technicians are forbidden from even purchasing refrigerants or servicing HVAC systems. Level 1 certification allows a technician to handle small appliances with less than 5 pounds of refrigerant. This includes window air conditioning units, freezers, and humidifiers. The exam covers recovery techniques, requirements, and safety. Level 2 certification allows technicians to handle products with high-pressure refrigerants in air conditioning and heating systems. The test for this level of HVAC certification covers leak detection, leak repair, and refrigeration. Level 3 certification allows technicians to handle products with low-pressure refrigerant which is usually found in chiller units. Each of these levels requires passing an exam. The North American Technician Excellence (NATE) certification is a nationally recognized program for HVAC and refrigeration technicians. A NATE certificate is not required to work in the HVAC field, but it does validate a technician’s knowledge and it can be earned in specialty areas like air distribution. The HVAC Excellence certification is an industry standard certification that includes the professional and master specialist levels. Earning the professional level credential requires having at least 2 years of field experience in HVAC and passing an exam in specialty areas like heat pumps and air conditioning. After passing the exam, HVAC contractors require a chevron for their specialty certification level and an HVAC Excellence patch. The master specialist credential requires at least 3 years of verifiable field experience and a passing score on the professional level HVAC Excellence exam. The RSES partners with NATE to provide additional certifications such as commercial refrigeration, heating, air conditioning, and HVAC-R electrical. One of the most common certifications is Certificate Member (CM), which is a classification of RSES membership available to RSES members. 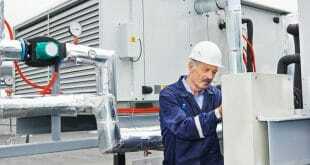 This exam tests 18 categories of knowledge in HVAC equipment installation and servicing.